you already own in NetSuite. NetSuite’s Financial Planning Module, or Adaptive Planning as it is called in the marketplace, is an extremely powerful tool. It makes it easy for organizations to improve operational efficiency, enhance internal controls and strengthen company-wide collaboration. Adaptive Planning is available in the Cloud anytime, anywhere. Join the thousands of organizations who are successfully utilizing Adaptive Planning as their single source for budgeting and forecasting. Armanino has the largest team of FP&A consultants devoted to Adaptive Planning implementations and customizations in the country. Our team trained the trainers for NetSuite’s Financial Planning Module and we understand the system inside and out. Armanino’s Cloud Solutions practice includes experienced CFOs, controllers and FP&A experts who can provide you with COA organization suggestions, technical accounting assistance and process reengineering solutions. Contact us so we can help your organization better optimize this powerful tool you already own by tailoring it to your needs and training your team on best practices. Email us at consultant@amllp.com or call us directly at (925) 498-1935. 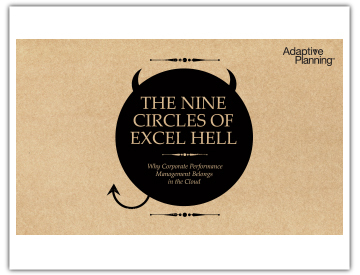 Read the “Nine Circles of Excel Hell” white paper for more about the challenges from spreadsheet budgeting. Call me! --Select One--YesNo I want to learn how I can free myself from Excel Hell.